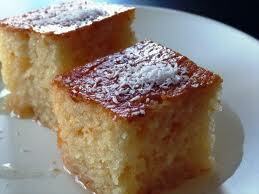 You will find variations of this cake just about everywhere in the Eastern Mediterranean. The stick cakes are usually kept in glass cabinets or under plastic to stop the flies from swarming around. You can buy them either wrapped in paper to eat on the hopor eat them there and then on a plate. Prepare one and a half times the amount of sugar syrup as in the recipe below and leave to cool. Put the semolina, sugar and softened butter in a mixing bowl and work together with your hand until well blended. Add the yoghurt and bicarbonate of soda and mix well together until you have firm batter. Grease well a baking dish measuring about 23 inch with tahini and spread the batter evenly across the dish. Flatten it gently with back of spoon , cover with a clean kitchen towel and leave to rest for three hours. Fifteen minutes before the time is up, preheat the oven to 200 C then cut the uncooked cake into 2 inc squares and press one blanched almond in the middle of each . Bake in the oven for 20 to 30 minutes or until golden. Take out the oven and pour the cooled syrup all over the cake. Leave to soak up the syrup and serve at room temperature. Sprinkle the top with coconut.